These no-bake bird's nest cookies are a fun and easy Easter treat that kids of all ages will love. 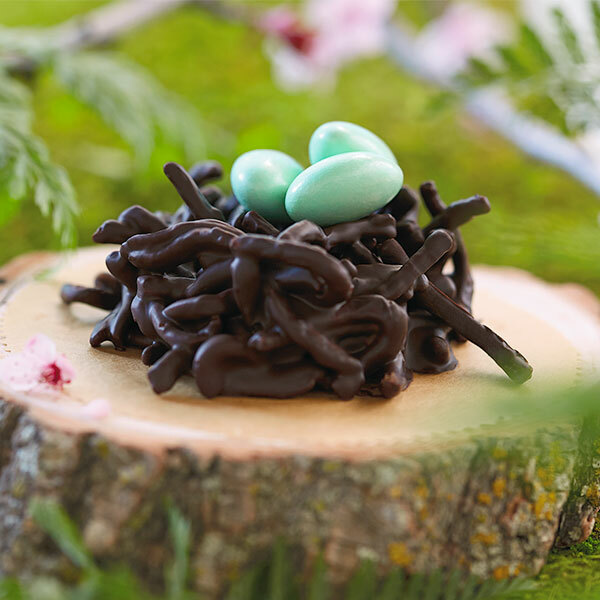 Made with just two ingredients—your choice of bittersweet or white chocolate chips and chow mein noodles—our sweet and simple bird's nest recipe is perfect for making with little ones. Once the chocolate nests cool and harden, fill them with candy eggs or jelly beans and dive in! Melt bittersweet or white chocolate chips in the microwave, stirring every 30 seconds. When chips are melted, add chow mein noodles and stir to coat. Drop by spoonfuls onto waxed-paper-lined cookie sheet. Form spoonfuls into nest shapes with the tip of your spoon, making sure to leave an indentation in the center for candy eggs. Let set on the counter until nests are cool and hardened. You can also place them in the refrigerator to firm up more quickly. Transfer nests to a serving platter. Place candy eggs in nests and serve.